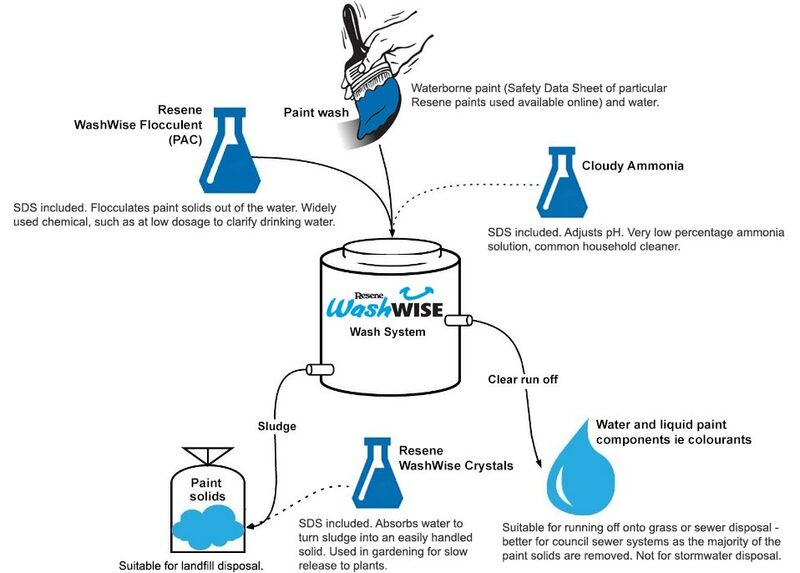 The Resene WashWise system separates paint wash, such as from cleaning up paint brushes, into paint solids and water/paint liquids. These can then be separately disposed of or reused in a more environmentally friendly manner than washing it all down the drain. Ideal for waterborne paints, excluding metallics. Resene WashWise units are available for ordering through your Resene ColorShop. Both work by containing the paint wash from cleaning up and rinsing brushes, settling out the solids after the addition of two chemicals, allowing removal of the top clear liquid layer, and leaving behind the paint solids sludge. The chemicals added are small amounts of cloudy ammonia (a very low percentage ammonia solution, just like bleach) which adjusts the pH to make the next chemical work more efficiently, and Resene WashWise Flocculent (PAC, commonly used in water treatment), which clumps the paint solids together and drops them to the bottom. The clear layer is then a mixture of water and the liquid parts of paint such as dyes. It can be reused to wash more brushes or drained onto a wide surface like a lawn, or into sewerage. It shouldn’t go into grey water systems or near natural waterways. The solids left over may be relatively dry or a wet slurry, depending on the individual batch of paint wash and what type of paint was used. They are nontoxic and can be disposed of through your regular rubbish service. If needed, they can be solidified further using Resene WashWise crystals (nontoxic, used in gardening) or left to dry after being tipped onto newspaper. The Resene WashWise – Mini system is ideal for small to medium work sites. Quick and portable, it is capable of taking 60 litres of paint wash a day. Additional chemicals may be purchased through your local Resene ColorShop. Step 1: Add 100ml of Cloudy Ammonia and stir aggressively. Step 2: Add 100ml of Resene WashWise Flocculent and stir aggressively. Step 5: Attach a waste pipe to the outlet tap and direct the other end to sewerage, a flat surface or lawn away from stormwater drains or natural water sources, or a waste container. Step 6: Open the tap and run off clear/thin coloured waste water. This is a mixture of water, colourants, and other liquid parts of paint. Do not release to stormwater systems. Step 7: Remove the paint sludge. This can be mixed with a small scoop of Resene WashWise Crystals to make it solid or left to dry, then disposed of through your normal rubbish service. The Resene WashWise – Standard system is ideal for medium to large and commercial work sites, and is capable of taking up to 300 litres of paint wash per day. Easy use features included such as a handheld hose spray gun and wash up sink. It uses a manual bilge pump to draw up the remaining paint slurry into large filter bags which can be reused many times. These instructions are for treating wash at the fill line level. See the table below for approximate volumes of Cloudy Ammonia and Resene WashWise Flocculent to add if the wash is below this level. Step 1: Add 600ml of Cloudy Ammonia and stir aggressively. Step 2: Add 600ml of Resene WashWise Flocculent and stir aggressively. Step 3: Check for separation. This should be visible after 30 minutes. Add an extra 200ml of Resene WashWise Flocculent if no change noticed. Step 5: Attach a waste pipe to the outlet tap and direct the other end to sewerage, a flat surface or lawn away from stormwater drains or natural water sources, or to a waste container. The height of the internal pipe can be adjusted. Step 6: Open the tap and run off clear/thin coloured waste water. This is a mixture of water, paint liquids, colourants, and other liquid parts of paint. Do not release to stormwater systems. Step 7: After separation, stir the sludge at the bottom of the bin. Step 8: Use the manual pump to pump up the slurry into one of the filter bags. When the filter bag is full, move to the next filter bag etc. Allow to drain. Squeezing the filter bag will speed this process. Step 9: Lift out filter bags and empty into waste for disposal. Rinse the filter bag back into the unit. Step 10: Repeat as necessary. Refill when enough liquid has been removed, or pump any remaining slurry into waste containers for later treatment or drying if unit needs to be completely emptied. The volumes of the Cloudy Ammonia and Resene WashWise Flocculent may be adjusted to suit. How much is needed will depend on individual use – how much water there is versus paint, what sort of paint etc. Try using more or less of each, or even excluding the Cloudy Ammonia, to help your Resene WashWise unit be more efficient and economical. Top WashWise tips to save you time! 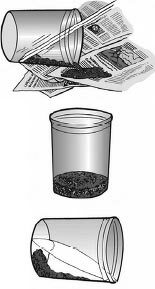 Brush or roll out excess paint onto newspaper or similar before washing. Wrap brushes, rollers and roller trays with paint in plastic cling wrap or an airtight plastic bag while you are on breaks or overnight. This will keep the paint moist. Different paint products will react differently to the treatment – don’t be surprised if one batch is sloppy and another relatively dry. Dilution of waste water (i.e. the amount of paint waste in liquid) will also impact significantly on the treatment process. As you gain experience, you’ll gain familiarity with how this impacts on the treatment. Dispose of ‘grey water’ responsibly only into sewer drains (not stormwater drains). Common sewer connections are drains inside buildings, such as the laundry tub or toilet. Any external drains are most commonly storm water connections and should NOT be discharged into. The recovered solids are pH neutral and make excellent mulching material. Alternatively, wrap sludge/solids and dispose of with your normal rubbish to landfill. Never place solventborne or two pack products into the barrel. Some strong colours, such as blues and reds, can tinge the treated liquid colour due to the high dye levels. Where possible, process your waste water onsite to impress your customers. Don’t use it in the back of your van! Leave leftover colours with your customers clearly marked with the colour name and area of use. Remember to recycle unwanted paint and paint packaging with Resene PaintWise. For more details see your Resene ColorShop staff, www.resene.co.nz/paintwise or the Resene PaintWise brochure. 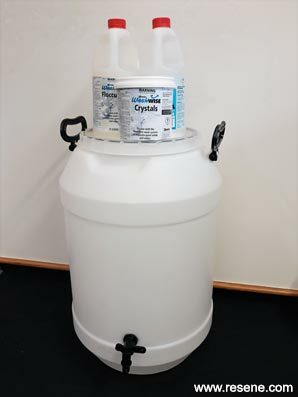 Wash brushes, rollers and other equipment with mineral turps in a large metal container/paint can. Use the least amount of solvent possible. Allow at least 24 hours for the paint solids in the first container to settle down to the bottom of the container. Keep the clear mineral turps and use it to top up the second container or decant and keep for future use. Scrape the paint solids out onto absorbent material, such as old rags, shredded newspapers or cardboard boxes. Allow to dry, then place in a plastic bag and dispose of with the household rubbish or take directly to the nearest council tip.